In the United States today, 157 million adults — approximately 50 percent of the nation's population — spend half or more of their waking hours at work. What better place, Rollins research professor Ron Goetzel believes, to improve health. As director of the Emory Institute for Health and Productivity Studies (IHPS), Goetzel devotes the bulk of his waking hours to working with employers to find effective ways to promote employee health, heighten worker productivity, and reduce unnecessary health care costs. Based in Washington, D.C., IHPS engages faculty, master's students, and doctoral students from the Department of Health Policy and Management in its studies. 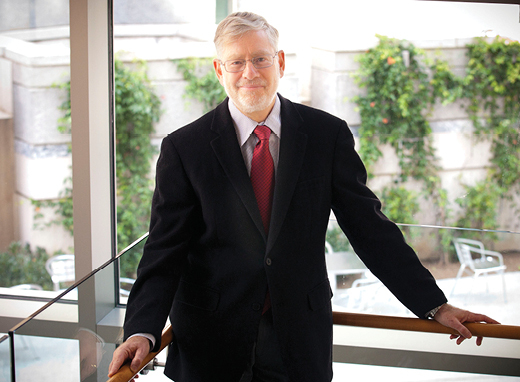 A key collaborator is Robert W. Woodruff Professor and department chair Ken Thorpe, whom Goetzel has known for more than 20 years. The two met when they worked for Medstat, known today as Truven Health Analytics, an IHPS partner, for whom Goetzel serves as vice president of consulting and applied research. "Ken's work has been instrumental in shaping health policy and unearthing the root causes of health care cost increases," says Goetzel. "Those increases are driven by disease states and the risk factors that precede them, such as obesity, poor diet, sedentary lifestyle, and smoking. His work is very much in line with my interests. I approach health promotion from a business perspective to help employers figure out what they can do, what's within their power and reach, to influence the health and well-being, and ultimately the performance, of their workers." The employers whom Goetzel counsels and studies read like a Who's Who of business and government: Lockheed Martin Corporation, PepsiCo, PPG Industries, the U.S. Department of Defense, the National Institute of Occupational Safety and Health (NIOSH), the Centers for Medicare and Medicaid Services, and insurance companies like American Specialty Health of San Diego. Goetzel also aided Discovery Health, the largest health insurer in South Africa, in gathering data to identify that nation's healthiest companies. New projects are planned or just beginning. Goetzel is working with the U.S. Office of Personnel Management in Washington, D.C., to pilot an initiative for federal workers and with Prudential Financial to study how telecommuting affects employee health. This past summer, the health commissioner of Baltimore contacted Goetzel to discuss what the city could do to promote health and wellness for its employees. "We spend a lot of time thinking about ‘promising practices' in health and productivity management—what can employers do to achieve a healthy company culture? What are the magic ingredients for that?" says Goetzel. "We help promulgate best practices, documenting that they actually work and produce positive health and financial outcomes for employers and their workers."